Crews are working diligently to prevent oil from the ruptured Pegasus pipeline from entering the main body of Lake Conway in Mayflower. If not for the quick work of Arkansas Game and Fish Commission staff, other state and local agencies, along with various hazardous material cleanup crews, the oil spill at Mayflower may have been much worse. Last week, a 20-inch pipeline carrying heavy Canadian crude oil burst spilling thousands of gallons of oil into a residential storm drain that leads to Craig D. Campbell Lake Conway Reservoir. The Pegasus pipeline carries crude oil from Patoka, Illinois to Nederland, Texas. Twenty-two homeowners in the Northwood subdivision were evacuated after the oil rushed across lawns and residential streets. At this time, oil has not reached the main body of Lake Conway. 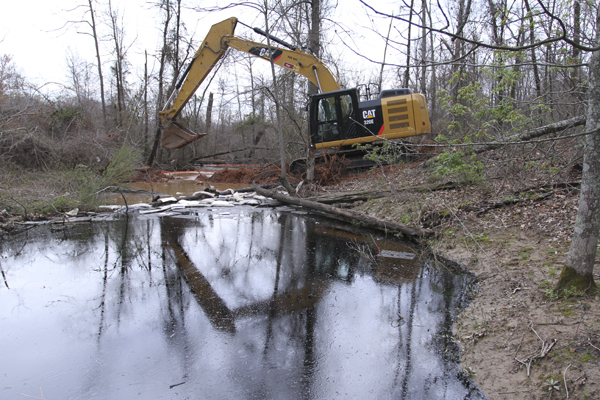 Several dams and booms have been erected to protect the lake from the spill. As of Wednesday, six dead ducks and a coot have been found. Nine other ducks have been found alive as well as a muskrat, a beaver, nine snakes and seven turtles that were affected by the spill. The animals have been taken to wildlife rehabilitators to be cleaned. If an oiled animal is found, the public should not handle any affected wildlife because of contamination concerns. Call 800-876-9291 to report any oiled wildlife. The 6,700-acre lake is located between Conway and Maumelle and parallels Interstate 40 in Faulkner County. The lake was built by the Arkansas Game and Fish Commission in 1948. Sportfish found in the lake include blue catfish, bluegill, channel catfish, crappie, flathead catfish, largemouth bass and redear sunfish. Lake Conway is the largest AGFC lake and the largest lake ever constructed by a state wildlife agency. Because of its large size, central location and excellent fishing, it has been one of the state’s favored fishing spots since construction began on Palarm Creek in 1948. Lake Conway was the first lake constructed by the Arkansas Game and Fish Commission. The lake is best known for its seemingly endless supply of bluegills and redears. Creel surveys indicate that bream are not only the most popular fish, they account for the most poundage taken by anglers. Bass and crappie fans also flock to Conway, hoping to catch one of the lake’s lunker largemouths or a mess of big slabs. Big blue and channel catfish are abundant, and Conway is a hotbed for monster flatheads. Fishing is good around logjams, brushpiles, stumps, cypress trees, lily pads buckbrush, inundated lakes, creek channels, private docks and the Highway 89 bridge. Numerous boat trails are cleared and marked. Boaters leaving the trails should navigate cautiously. Many stumps and logs lie unseen just below the water’s surface, making spare shear pins essential gear here. An east-side nursery pond stocks millions of crappie, largemouth bass and catfish directly into the lake. Fingerling fish from hatcheries are fed until they reach sizes ensuring safety from most predators. The fish are then released into the lake through a canal. Before the nursery pond was constructed in 1968, crappie were almost non-existent in Lake Conway.